Hope you guys appreciate the entry because I will NOT be reshooting it! This unlikely photo is my neighbor's house burning to the ground in spectacular fashion about 150 feet from my back door. Firefighters from six towns responded the blaze, but the structure was completely gone in 30 minutes and several fire hoses were lost to the intense heat. 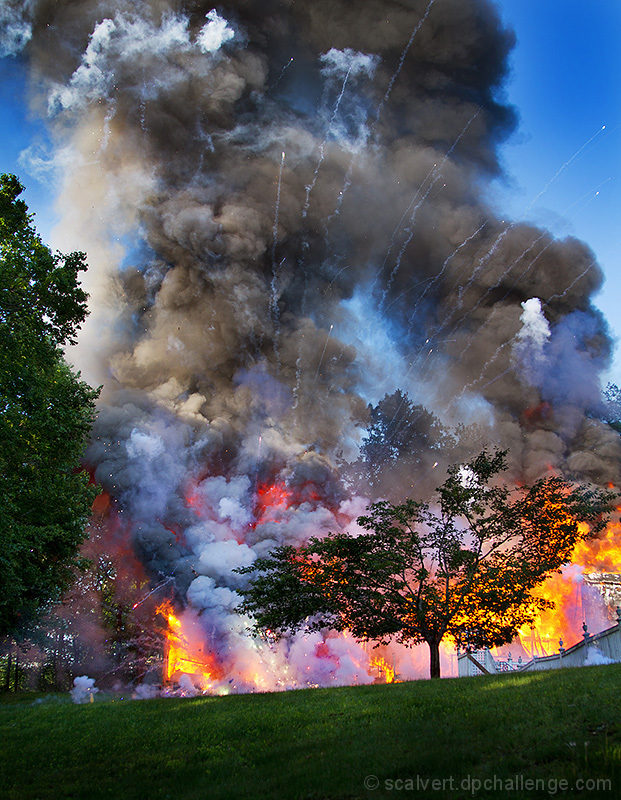 A huge stockpile of fireworks and ammunition had apparently been stored in the garage, and when the garage collapsed it set off a series of explosions that rocked the entire neighborhood. This was one of the last frames I took before the bigger munitions started going off and I hit the deck. A volunteer firefighter shielded me on the ground with his body as roman candles and flaming debris rained down on us (it burned my hair in one spot). When the explosions had died down enough to look up, we found a brush fire only inches behind us and I had to make a run for home. Fortunately there were no serious injuries and emergency crews did an incredible job of keeping the fire from spreading. They decided to let it burn out, and it was still a pretty big fire when I went to sleep 8 hours later. I gave a framed print of this photo to the local fire department as thanks. A few outtakes are posted HERE. Was away when the FS results were announced, can't believe this did not ribbon ! Thanks for sharing your pictures and story - amazing is the only word I could come up with. Incredible story you have to tell. The out takes are spectacular! Just seeing the smoke trails gives me the shivers. I was at a fireworks accident once. Yikes! A tremendous PJ shot. I hope the papers printed it. Terrible story. Great shot! Glad to hear you came out unscathed (if not unsinged). I'm surprised there was anything left to loot! What was the ammunition that was stored there? In any event, it's a spectacular shot. Glad those firefighters were at the top of their game that day! Wow....what a story! The picture is incredible!! I'm disappointed not to see this in the ribbons. It's a spectacular shot. I'm glad you weren't hurt - thanks for including the story. I came over here to see if there was a story...and there was! Thanks. And I'm glad nobody got hurt, except for your one bald spot. I guess now your neighbor's secret stash is no longer a secret! or a stash! Crazy. Too bad you couldn't get this in Harsh Environments. Fencing company??? LOL. They're supposed to be securing the site, aren't they?? Man, people are loopy. Good for you for bagging the dirtbags! Some images deserve the story in the voting process. Perhaps the two who voted 4 would've seen this a little differently. Good stuff, scalvert. Holy CRAP! What a story! What a shot! HOLY BUCKETS, You deserve a purple heart for shooting this!! Amazeing!!! That would certainly mess up a good day. That's one heck of a scene! I'm picturing a similar scene in the original Naked Gun movie... "There's nothing to see here! Please disperse!" Hope you didn't started this. Great catch! Is this for real or hopefully a movie scene? Amazing image in more ways than one. Amazing energy. The shrapnel really captures your attention! Proudly hosted by Sargasso Networks. Current Server Time: 04/24/2019 05:48:57 AM EDT.